Safe Travels USA - Cost Saver Insurance provides comprehensive medical coverage for individuals, families, or groups traveling to the US. 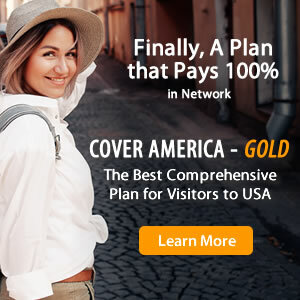 This temporary insurance plan pays 100% in network, after the deductible, up to the policy maximum and offers travel medical protection including out-patient treatment, in-patient treatment, emergency services, emergency medical evacuation, and more. Outside of the network, the plan pays 80% of the first $5,000 and 100% thereafter for covered expenses after the deductible is satisfied. Safe Travels USA - Cost Saver Insurance covers trips between 5 days to 2 years and allows visitors covered under the policy to visit any doctor or hospital within the PPO Network. Safe Travels USA - Cost Saver Insurance is best suited for senior or elderly international tourists visiting the US and US immigrants or US green card holders making a trip to the US. Safe Travels USA - Cost Saver Insurance? How to Buy Safe Travels USA - Cost Saver Insurance?